The Sound Rangers train keeps on chugging. The popular rhythm-based RPG is pumping out three consecutive Mega Man events this month, promising new characters and tunes to battle to. No Legends characters this time, however; this one's all about the classics. On March 10th, new stages based on Mega Man 2, Mega Man 4, and Mega Man 5 are slated to appear. 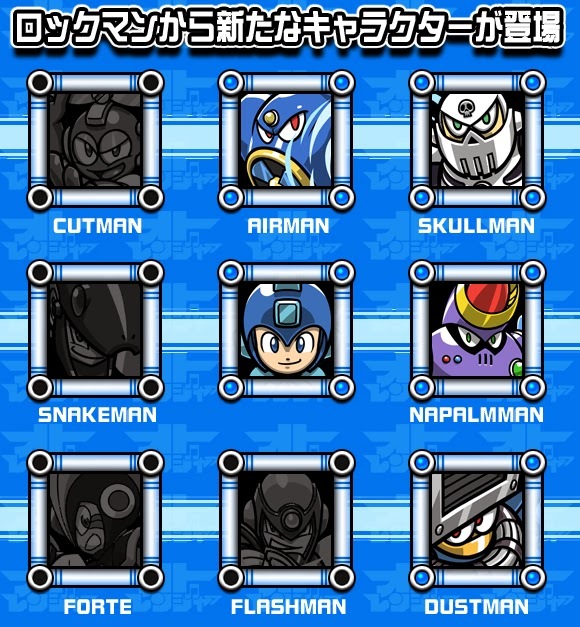 Players can test their metal against Air Man, Skull Man, Napalm Man, and Dust Man. During this time, you'll have the chance to win several classic Mega Man characters from "gacha", including the above Robot Masters. The second and third events, also beginning on the 10th, free distribution Bass & Treble and Dust Man. Much like Mega Man & Rush previously, Bass and his faithful canine are being billed together for extra strength. Two character stats in one, basically. And then there's Dust Man. Yep. Doubtful this is the last we'll see of Mega Man x Sound Rangers. Mega Man content is pretty popular with Sound Rangers players... they keep coming back for more. Bet Air Man's beat can rock!